Breakfast was a 7am at Deli Cafe next door to our hotel. Better than yesterday’s at LoLo Cafe. A good coffee is a definite when we have a long day planned. Then it was luggage downstairs ready for the trip across to Isola Isabela our next stay. The swimming group are bonding and it’s fun and interesting to learn more about our fellow swimmers. We had our usual briefing with Fernando our guide, then walked together to the port. 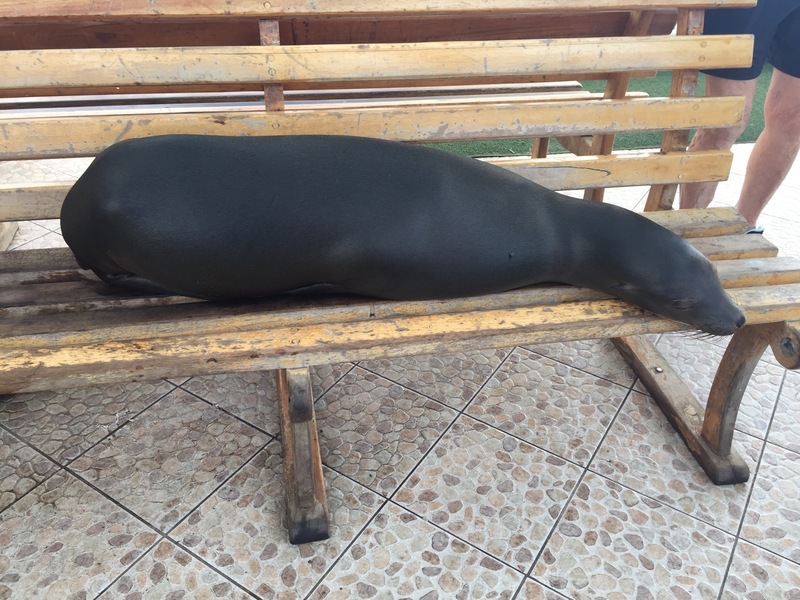 Sitting on one of the seats was a snoozing sea lion with his brother dozing under the seat. An everyday scene in Galapagos. Into the boat and away. Two hours away! The boat was snug and the day was hot! We sweated together chatting and dozing and bumping along. This is the surprise to me. The distances between islands. 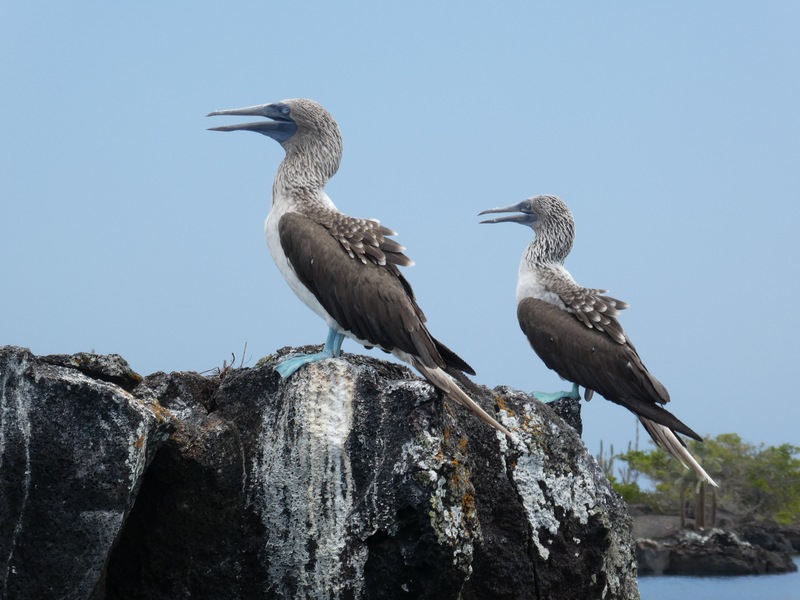 When you come here to Galapagos, you can choose to have a cruise where you live on board and they take you from place to place for snorkelling, swimming, observing and walking. Or you can stay on land and book tours of the more interesting places to go. If you choose this option the lady to talk to is Jill Blythe from Galapagos Alternative. She and her husband have helped put the swim trek together and has a business to help travellers who do it alone. Neither of these ways includes the longer swims we are doing. This is a first and we are lucky enough to be on this trip. 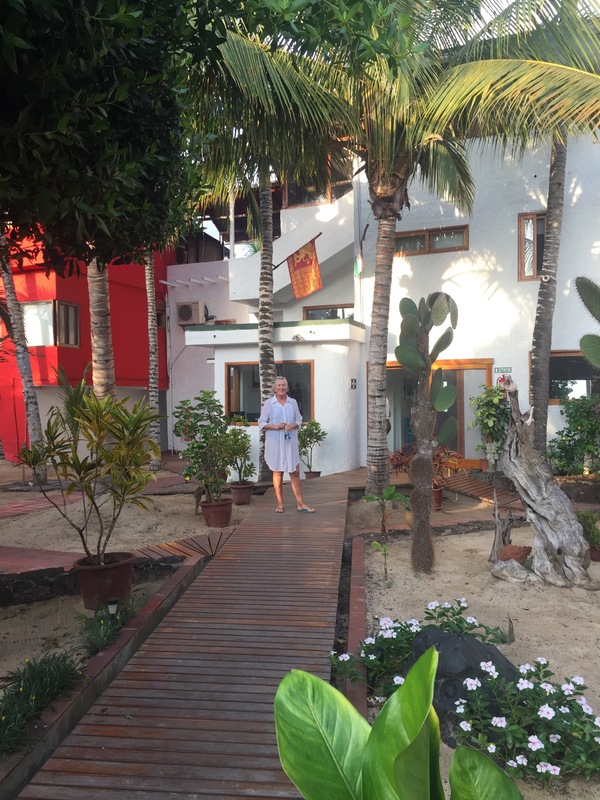 After arriving at Isabela (Puerto Villamil) and Casa De Marita we had a lovely lunch before heading out for our afternoon swim. 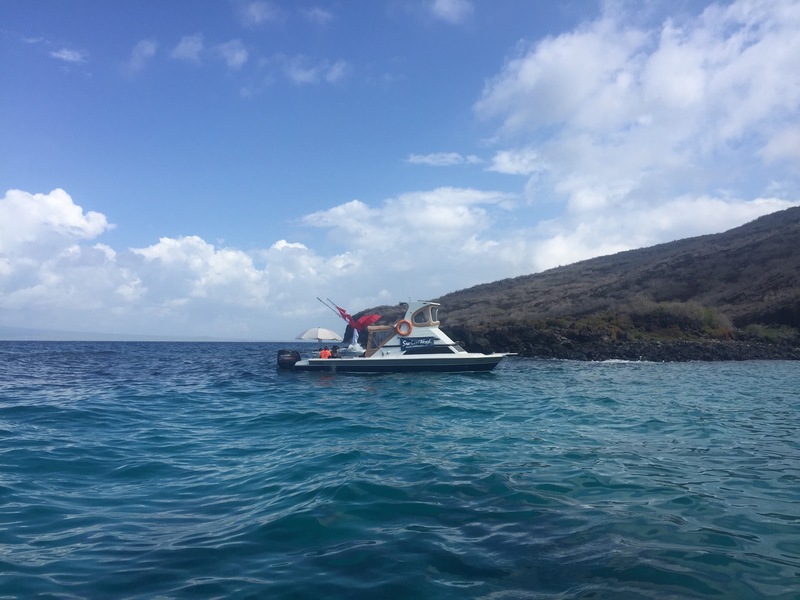 The new island is a great place – much quieter than Porto Aroya. We all lined up on the deck waiting to leave. We were facing the beach and for a moment I was tempted to stay ! But no the swim sounded too good. 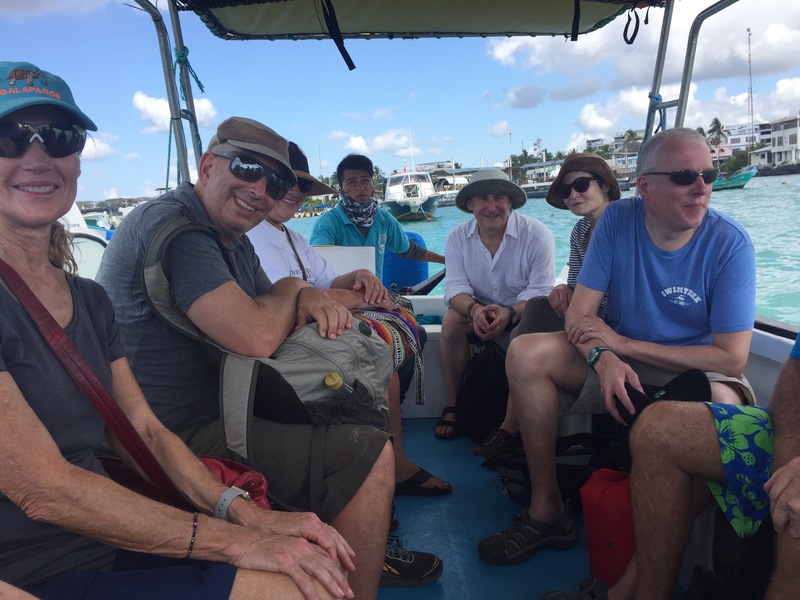 The hard part was being back on the boats for a bumpy ride of about an hour to the Los 4 Hermanos. Once again two boats. One with not much shade! Today it was my turn on the sunny boat! Into the water we jumped. Pink, yellow and orange caps last. It didn’t take long to spot the sea life. We swam into a cave with lots of spotted eagle rays. It’s a bit disconcerting for an Aussie, knowing the Steve Irwin story, to look at the ray, look at the long pointy tail and not be just a little scared! However Fernando said he had been an idiot and tried to ride the ray! So I pretended to be brave and swam around counting the rays. We then saw a white tipped shark, lots of yellow tipped fish, iguanas and birds. What the collective noun for a group of iguanas? A mess! We hugged the coastline and swam and swam spotting fish,sharks, turtles, Blue footed boogie birds, sea lions and iguanas on the rocks. Amazing. Our swim this afternoon was 2.5km. and we all felt great. Back on board it was afternoon tea. Very different to the snacks provided by the guides on other treks. And no hot tea. Mind you the water temperature is so good we’re not feeling cold. Feeling pretty chuffed at swimming so far, we bumped across to Isola Pinzon to a gorgeous cove where we played with the assorted sea life. 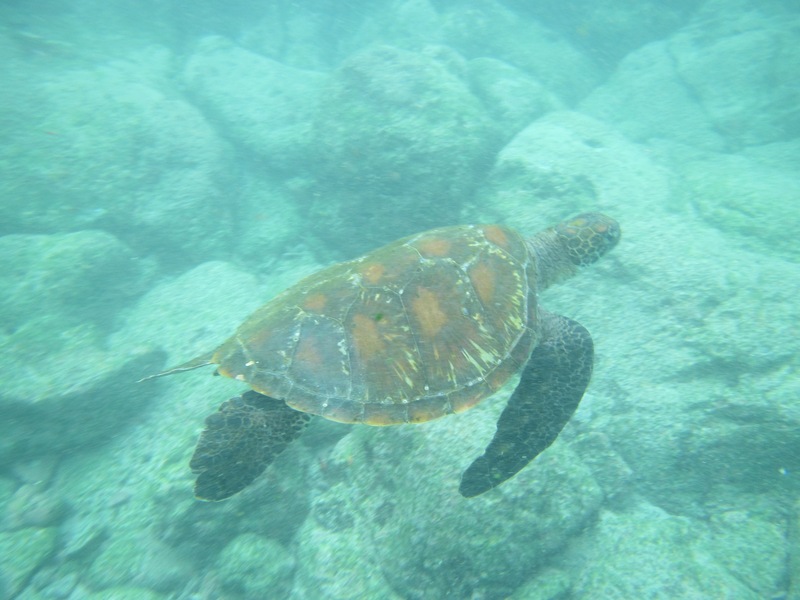 Turtles, sea lions and fish of all colours. It was a highlight. We added another 1.5 km swim along the west coast of Santa Cruz. Then onto Isabela. Well deserved shower and off to the lovely low key village centre for dinner at the Grill. Fell into bed for another 7 am breakfast. The days on tour are long and exciting. Not much down time. Unless you count the time spent in the boat bumping over the water to the next adventure.